Week 12 complete – two thirds through! So I’ve just completed week 12 of my training for the London Marathon and there are just 6 weeks to go before the big day. The last 3 months since I started out on my training have really flown by. I have run over 230 miles in that time and it’s difficult to believe that I am now two thirds of the way through my training. * This week was an ‘easy’ week – I have done 2 yoga classes, a powerplates class and run a total of 28 miles. Only in the world of a marathon trainee would that be considered ‘easy’! * I now consider 8 miles a reasonable distance to consider running before work. I used to struggle to complete 3. * I completed 12 miles comfortably today feeling confident all the way round. Just 5 weeks ago I was really nervous about running this distance for the first time. * My Sunday cooked breakfasts have been replaced by porridge and banana. While I kind of miss my scrambled eggs on toast they just don’t set me up for a long run in the way that porridge does. 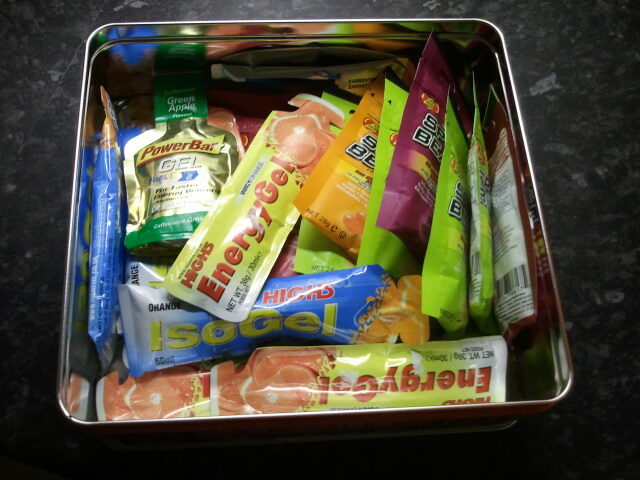 * I have my own tin in the kitchen for my running fuel! Mr J loves jelly beans but he knows to keep his hands off these! * I took the day off work today to do my long run. We were away at the weekend at my cousin’s wedding. I knew that I would be in no fit state to run yesterday (I was correct) so decided to take the day off today to make sure I didn’t miss a long run. This is the second time that I have taken a day off work in order to do a long run. Some would call this madness, I call it dedication! It’s good to reflect on how far I’ve come before looking forward to the final 6 weeks of training. In just 3 weeks time I will complete the longest training run in my plan and then start to taper for the big day itself. Part of me wishes it was sooner, part of me wishes I had longer to prepare. All of me knows that the training I have done so far and will continue to do will set me up to do the very best I can on April 22nd. In just 40 days time I will run the London Marathon! And just to finish I thought I’d share this photo with you – taken on Saturday night at the wedding. 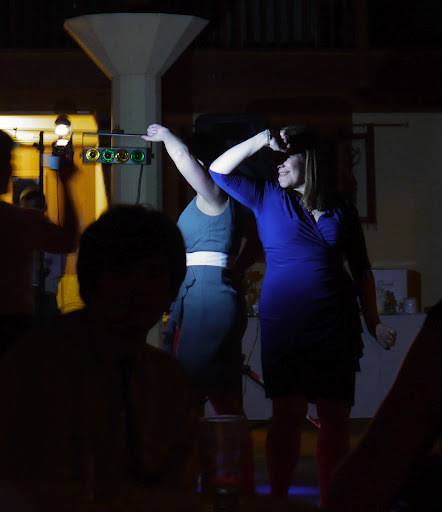 Me and my cousin doing our very best Adam Ant ‘Prince Charming’ moves on the dancefloor – counts as cross training, right?! Previous Week 11 – Done! Next Week 13 complete – phew! It is amazing how our perspective changes as the training progresses. I really enjoyed my step down week. I miss just being able to go for an easy run before work each day. I love the gel tin..it reminds me i need to go and buy a few more! Do we need to bring our supplies of these on the big day? I know exactly what you mean, I am really looking forward to just being able to go for a run of a distance I choose because I fancy it, rather than because it's part of a plan. On the day there will be lucozade body fuel gels at two points on the course. Personally I'll be bringing my own – I want to make sure that I can take them when I need to, not only when they're provided. I've been meaning to do you a list of things to remember to bring with you – some that I picked up from people that have run many races before and some things I've discovered myself. I'll write it and send it through to you. Love the Adam Ant dance moves – I think it definitely counts as cross training (then I can count every time I Dance Magic Dance across my living room). It's so amazing the way perceptions change, isn't it? They do say that it takes 6 weeks for new habits to form, do you think the early-morning runs are a habit that will stay with you beyond 22nd April?